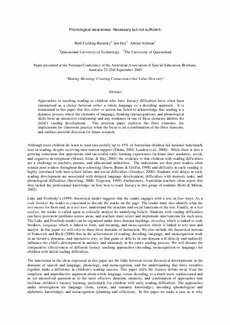 Approaches to teaching reading to children who have literacy difficulties have often been summarised as a choice between either a whole language or a decoding approach. It is maintained in this paper that this either or notion has failed to acknowledge that reading is a dynamic process where the elements of language, thinking (metacognition), and phonological skills form an interactive relationship and any weakness in one of these elements inhibits the child’s reading development. This position paper explores the three elements, the implications for classroom practice when the focus is on a combination of the three elements, and outlines possible direction for future research.